If you’re anything like me, you spend a lot of time dabbling with one special effect, moving on to another image, trying another effect and keep on experimenting without a specific aim in mind. Wouldn’t it be better to put the effects you like already to some constructive use, rather than continually roaming your effects library for others? That’s where the batch processing option in the Google Nik Collection is so useful. What, you didn’t know there was one…? It’s easily overlooked, but breathtakingly simple, and here’s how it works. 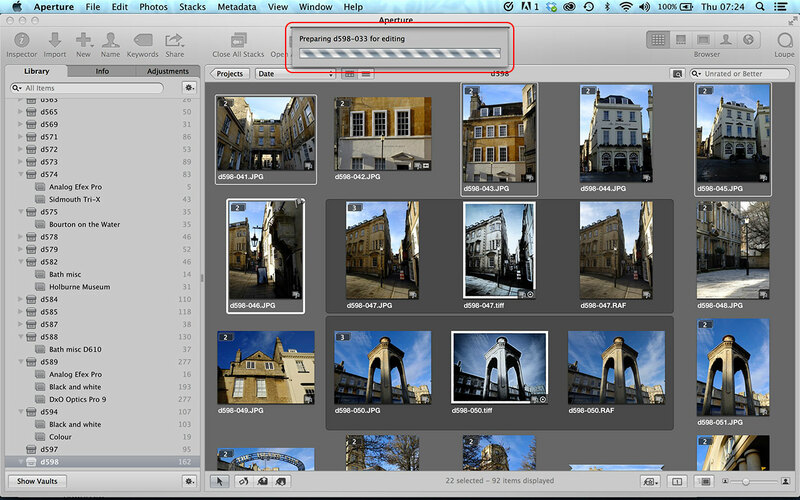 I’m going to launch it from within Aperture because there are some cataloguing features in Aperture which are really useful at the end of this walkthrough, but you could just as easily work from Lightroom instead. 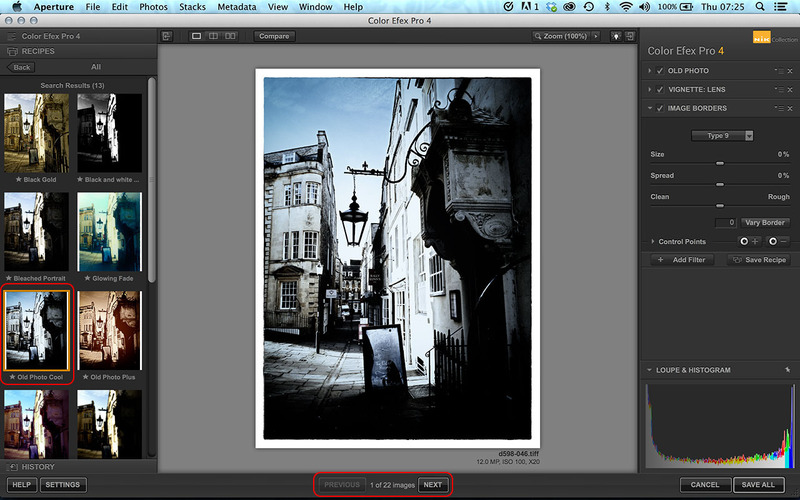 I’ve opened a project containing some architectural shots I took recently around the streets of Bath. At the moment they’re regular JPEGs, but I think they’ll look good with a cool-toned old photo effect I’ve created in Color Efex Pro, which is part of the Google Nik Collection. This comes as a set of plug-ins for Photoshop, Lightroom and Aperture. I’ve selected all the images I want to edit, right-clicked one of them (it doesn’t matter which) and I’ve chosen Color Efex Pro from Aperture’s plug-in menu. At first sight, everything looks normal in the Color Efex Pro window. 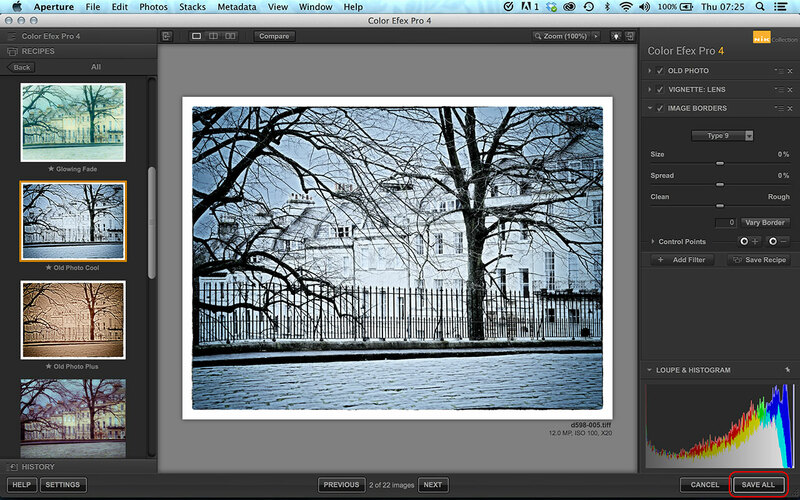 I’ve chosen the effect I want (‘Old Photo Cool’) from the Presets sidebar. You have to look at the bottom of the window, though, to see what’s different. Now there is a ‘Previous’ button (greyed out because I’m looking at the first image), a ‘Next’ button and, in between, it says ‘1 of 22 images’ – that’s the number of images I sent to Color Efex Pro from Aperture. Color Efex Pro now loads the next image – and it inherits the same settings used for the first one, so actually I don’t need to do anything at all. So rather than go through each of the 22 images in turn, I’m just going to click the ‘Save All’ button in the bottom right corner of the Color Efex Pro window.